Novgorod the Great (before 1999 was named simply Novgorod) is one of the most ancient cities of Russia located in its North-West, near the site where the Volkhov river takes its waters from Lake Ilmen, emerged as a political center of Slavic and Fino-Ugric tribes in the mid-9th century, while as a town it was formed in the middle of the 10th century. 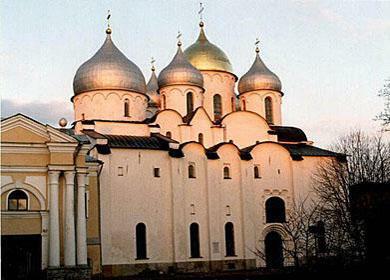 Many experts of Russian art justly believe Novgorod to be Russian Florence; no other old Russian cities have managed to preserve so many ancient architectural monuments adorned with wall murals. You will see that with your own eyes visiting the churches of Our Saviour on Nereditsa Hill and Annunciation of Our Lady on Miachino Lake (12th century), appreciating at its true worth the 14th century frescoes of world-famous Theophanes the Greek in the church of the Transfiguration of Our Saviour on Iliah Street, singularly graceful murals in the churches of the Nativity of Our Lady on Krasnoye Field, St. Theodore Stratilates on the Brook, admiring the beautiful clergical wall calendar of the 15th - 17th centuries in the Church of St. Simeon The Godreceiver, studying wonderful mural compositions of the late 17th - early 18th centuries in The Virgin of The Sign Cathedral. 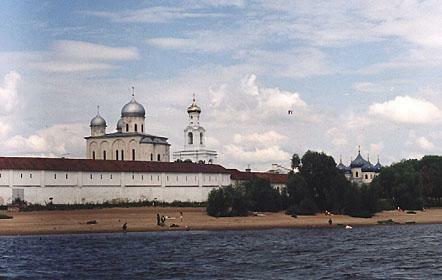 Icon "St. Nicolas" today's walls and towers were constructed at the close of 15th century. The Detinets (that was the original name of the citadel ) was closely related to all most important events in the life of ancient Novgorod: hosting foreign embassies, seeing-off warriors to fight the enemy, convening people veche meetings. In addition to the above-mentioned St. Sophia's Cathedral, the Kremlin also features such other striking monuments as the Faceted (Archbishop's) Palace - a rare specimen of Gothic architecture, built in 1433 in team with German masters, as well as the impressive and beautiful St. Sophia's Bellfry of 1439 with a set of bells dating back to the 16th - 18th cc. A visit to Novgorod usually leaves guests with unforgettable impressions of the inimitable and majestic Novgorod landscape which can be appreciated by making a boat tour of and Lake Ilmen, by seeing Peryn - the site of the pre-Christian heathen- temple, by going to Lipno island with one of the few preserved architectural specimens of the 13th century - the Church of St. Nicholas decorated with frescoes of the same age. It is also only in Novgorod that visitors can admire a unique collection of facial and ornamental embroidery of the 16th - 17th centuries. Exhibited in the Kremlin's St. Ioann building, it features such wonderful works of ancient Russian embroideries as maniples of St. Varlaam of Khutyn (12th c.), shroud, commissioned by Dmitry Shemyaka (15th c.), omophorion of Nicon (17th c.), etc.